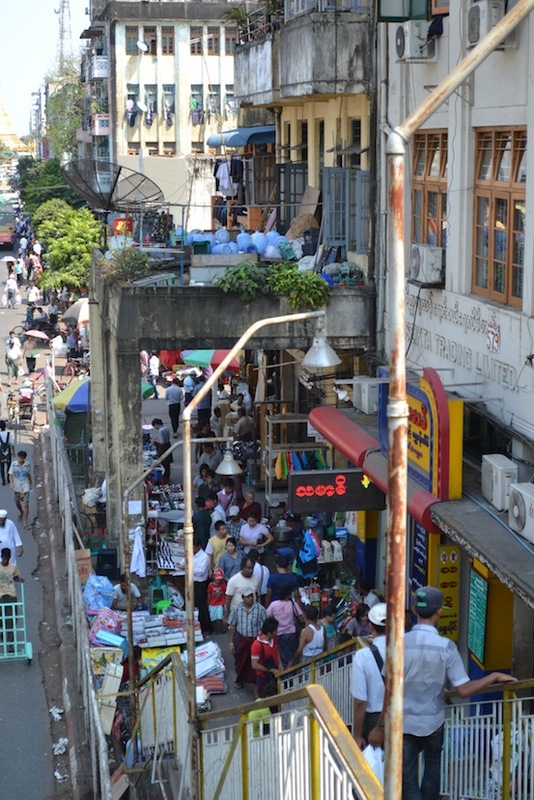 The streets of downtown Yangon looked to us like a big marketplace. 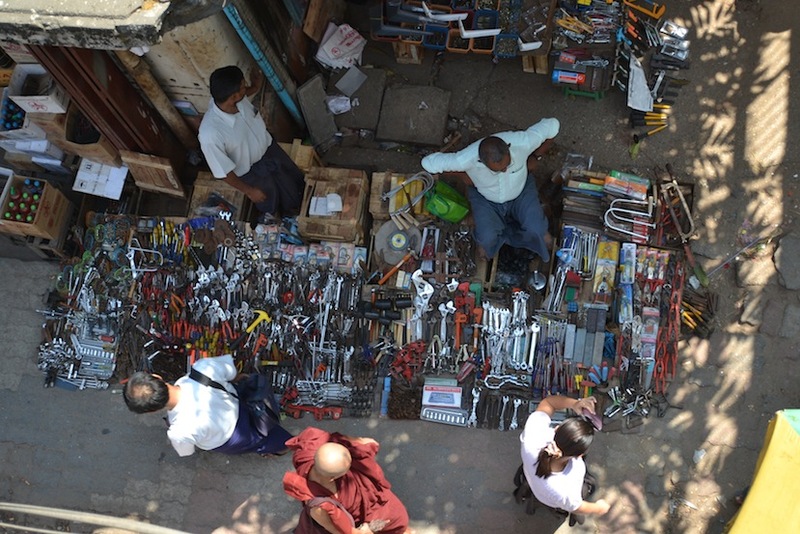 Sellers fruit, vegetables, ready food, drinks, tools, clothing, you name it. All being sold in shops and stands or from simple blankets on the street. The area where we stayed first couple of nights (in Agga guesthouse) was lively and we liked it; there were lots of small restaurants and food stands. 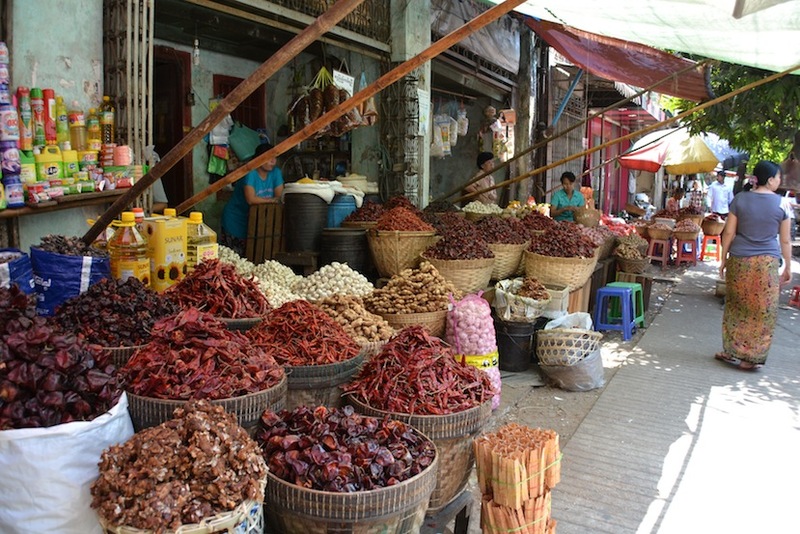 Thanks to this market-like feel and street food, this area reminded us of cities in India, just a bit more organised and clean. Very easy to navigate as this part of the city is set up in long straight roads and streets that turn the city into a chessboard-like grid. Where we stayed at the end of our trip, the neighbourhood was very different. 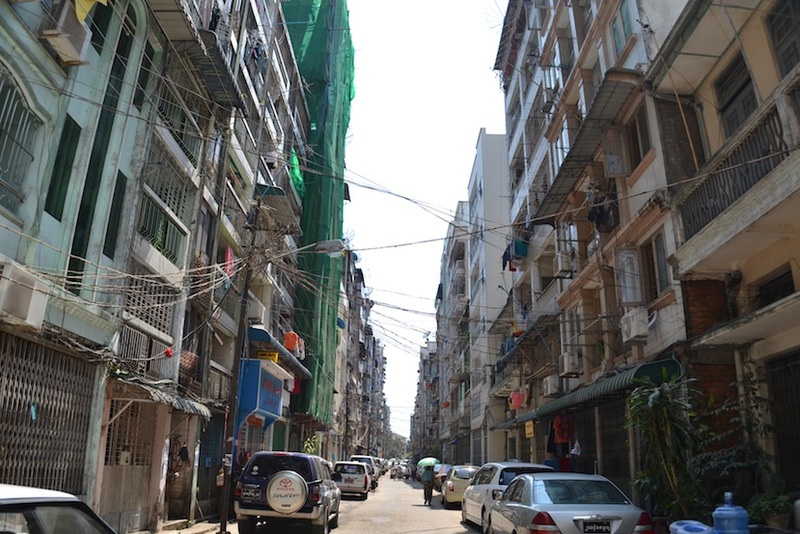 Definitely more upscale, streets were wide and the area less densely populated. 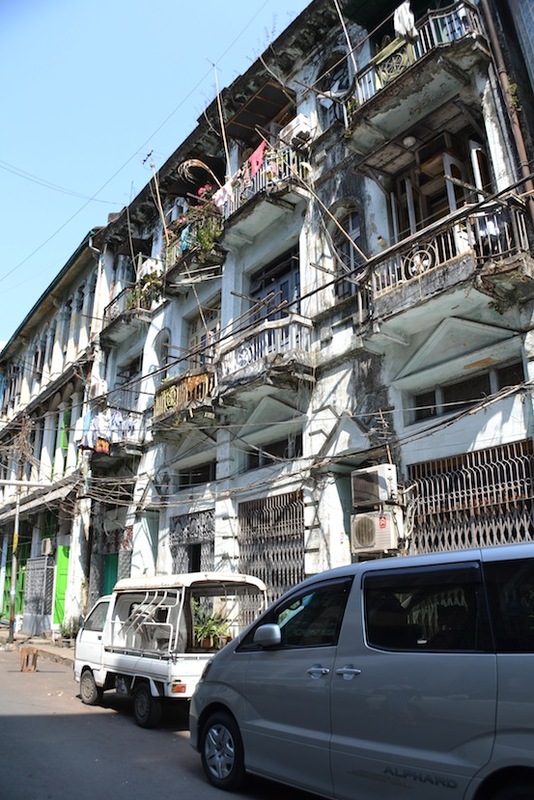 We saw lots of old buildings, some rundown, but often with pretty classic facades and balconies. On our walks we noticed a very interesting way of getting mail: it might be hard to see on this picture below, but people on the higher floors (generally up to about the 7th) would lower down a long rope with a large clamp at the end. The mailman would put their mail in the clamp and slightly pull the rope which often would ring a bell at the top end of the rope. Pull your rope up and there you are: your mail without having to walk down! Also other modes of communications were a bit different from what we know. 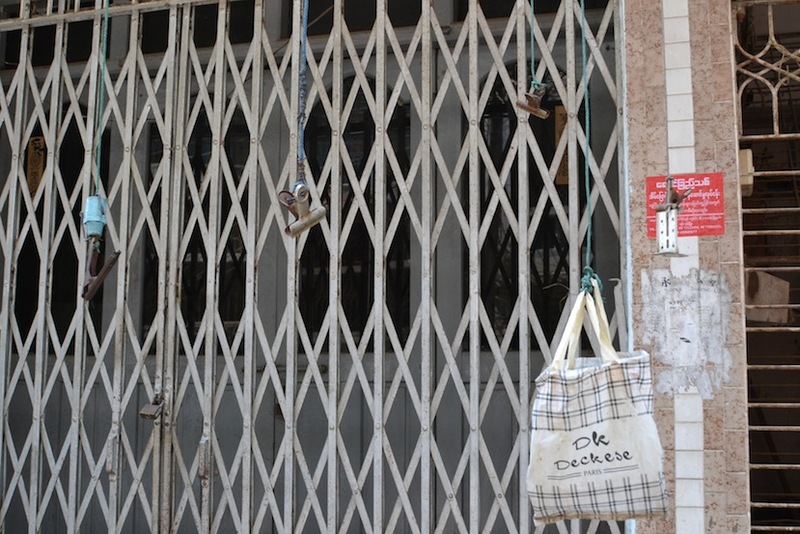 Instead of phone booths, smart businessmen in Myanmar set up a small table on a pavement, hook their landline device into a switch box on a street and charge their customers a small amount for this service. Getting a SIM card in Myanmar is not easy we heard; people who cannot pay initially high fees, have to sign into a lottery to wait their turn for a new number. 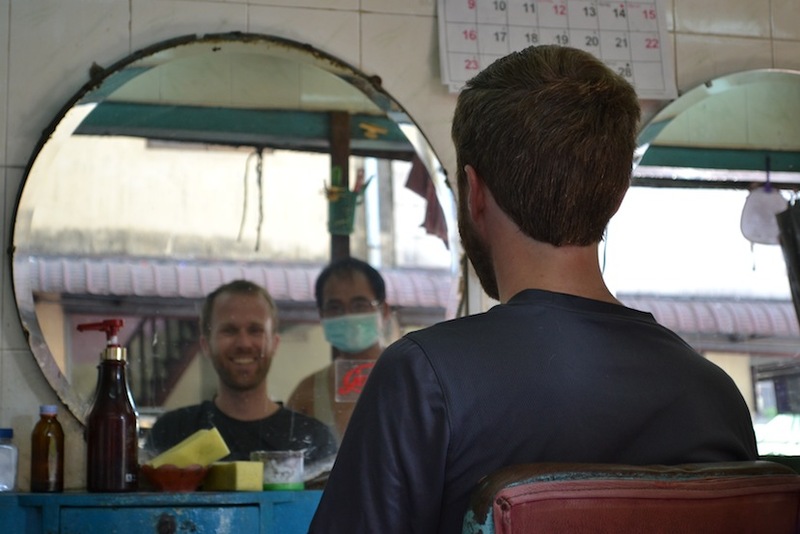 Mark was particularly happy with the 1 euro haircut he got at one of the typical barbershops: 2 chairs in an open room facing the street. He didn’t tell the guy how he wanted his hair down as he just started cutting. Good result though. So good that Mark went back 4 weeks later after we returned to Yangon again. 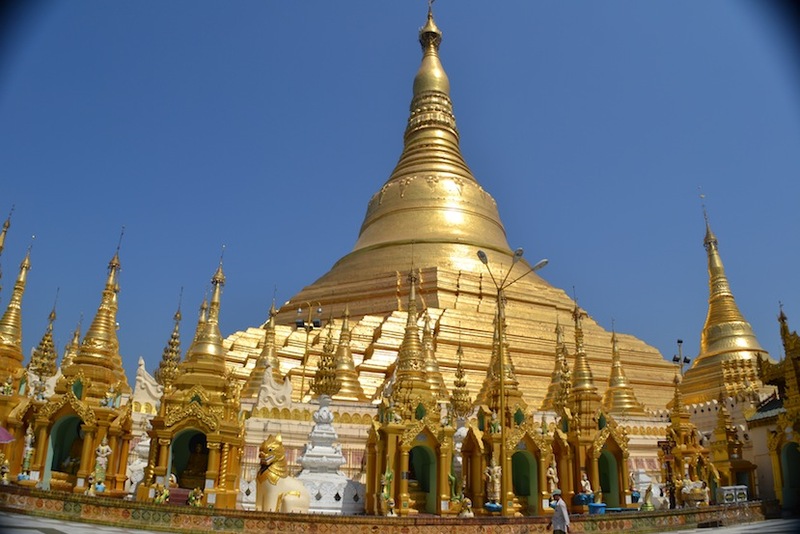 The main attraction in Yangon is the Shwedagon Pagoda, a nearly 100m golden pagoda that according to legends has existed for over 2500 years (in different shapes and heights). It’s set on a large area with many other stupas, pagodas and temples surrounding it, most of them also covered in gold. An amazing sight, especially when the sun reflects in all the gold, diamonds and precious stones. We spend a few hours here hiding from the heat and watching locals doing their thing. There were a lot of people as to buddhists this is a very important place. Interestingly, it is very important for them to know what day of the week they were born on as there are day-specific corners and shrines at the pagoda where you do your rituals. As a foreigner, you also pay the government here, $8 per person this time and it’s hard to get around. If you’d like to try though, you get a sticker to put on your shirt and apparently you can just take a sticker from someone that just came out. Here are a few pics of this beautiful structure and it’s surrounding buildings. 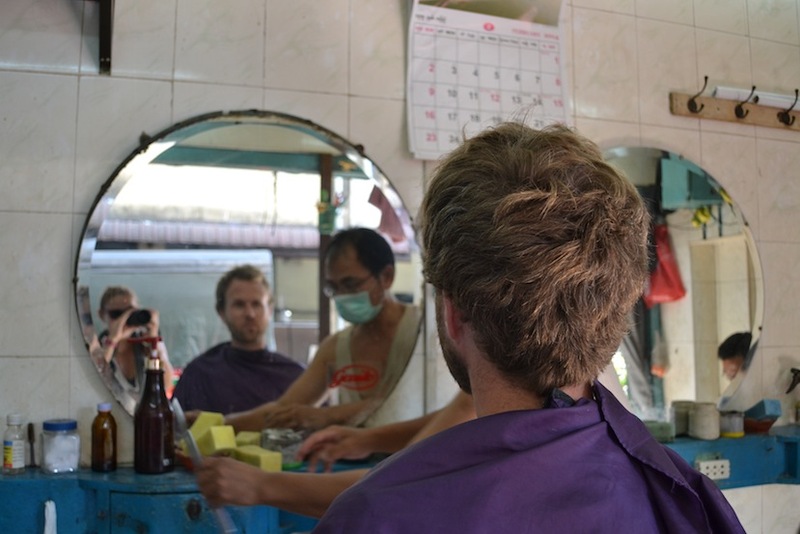 It took quite a few mails and a bit of planning from both sides, but eventually we got it done: our last evening in Myanmar coincided with Maarten and Nicole’s first evening. 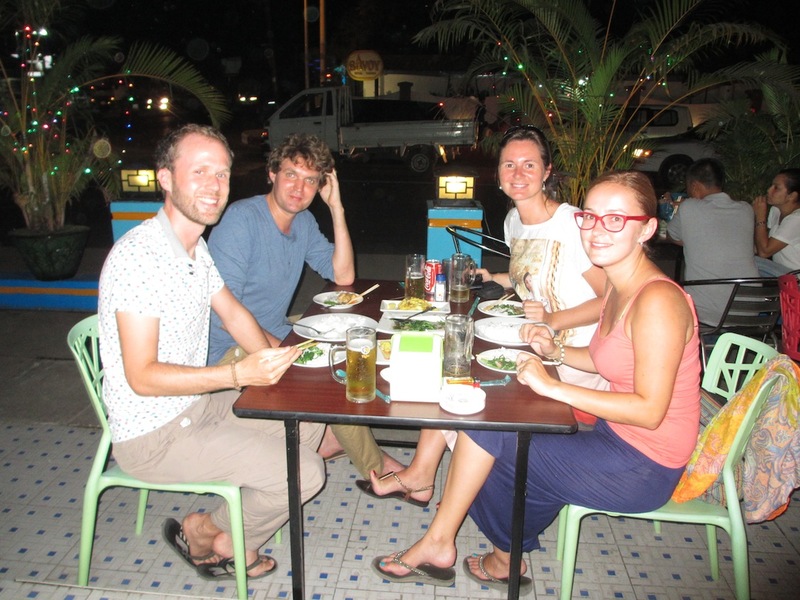 Maarten and Nicole (good friends from Holland) are in Yangon via VSO, an international development organisation that helps fighting poverty in developing countries by placing volunteers on medium (few months) to long (few years) assignments. Mark and Maarten know each other since the start of university in Rotterdam and have both been away from the Netherlands for quite a few years. Therefore it’s not always easy to meet up so it was quite special to have a few hours together with both wives in Myanmar of all places! They picked us up at our place north of the city centre and we went for dinner and drinks a short walk from there. The hotel where we stayed had a small zoo in its courtyard: parrots, cockatoos, ponies and many dogs must have been the owner’s hobby. The next day we took an early taxi to the airport and boarded an AirAsia flight back to Kuala Lumpur where we spent the night in a convenient hotel for overnight changeovers, fairly close to the airport. From here we had another early morning AirAsia flight, but this time bound for a new continent: Australia! Yangon (alebo Rangun) je najvacsim a komercne najvyznamnejsim mestom Myanmaru. Logicky by sa zdalo, ze Yangon je hlavnym mestom krajiny, no od marca 2006 tomu tak nie je a statut hlavneho mesta bol udeleny novovybudovanemu mestu Naypyidaw, ktore sa nachadza zhruba uprostred krajiny. Yangon bol nasim vstupnym i vystupnym bodom a okrem letiska, autobusovej a vlakovej stanice sme tu zaznamenali i niekolko inych zaujimavosti. Ulice centra Yangonu nam pripominali trziska. Predajci ovocia, zeleniny, hotoveho jedla, napojov, naradia, oblecenia a cohokolvek, co si viete predstavit. Vsetci predavali bud standardne v obchodoch, alebo v podomacky vyrobenych stankoch, na stolikoch alebo na dekach rozprestrenych na chodnikoch. Cast mesta, v ktorej sme boli ubytovani pocas prvych dni (Agga guesthouse) bola velmi ziva s mnohymi restauraciami a stankami. Vdaka poulicnemu jedlu a atmosfere trhoviska nam Yangon ihned pripomenul mesta v Indii, no ich mierne organizovanejsiu a cistejsiu verziu. Orientacia v tejto casti mesta je velmi jednoducha, kedze ulice su dlhe a kolmo prepletene do sachovnice. Cast, v ktorej sme byvali nakonci bola o nieco ina. Evidente bohatsia a tak ulice boli sirsie a zastavba menej husta. V meste najdete budovy stare i nove, niektore maju znicene fasady, no niektore si este zachovali svoj kolonialny sarm. Pocas prechadzok sme objavili zaujimavu postu lokalnych obyvatelov. Namiesto schranok im z balkonov visia snurky, na konci ktorych postar pricvikne postu na priviazany stipec. Potom staci snurkou pomykat a adresatovi sa na balkone rozozvuci zvoncek. Snurka sa jednoducho vytiahne a nemusi sa pre ranne noviny chodit dole schodami. Aj dalsie formy komunikacie su v Myanmare ponate trochu inak. Namiesto telefonnych budiek si tu vynaliezavi podnikatelia postavia na chodnik stolik, pevnu linku zapoja do budky telefonnej spolocnosti na ulici a za poplatok predavaju telefonaty. Poculi sme, ze ziskat SIM kartu tu nie je az tak jednoduche a ludia, ktori si nemozu dovolit zaplatit privysoke aktivacne poplatky sa musia zaregistrovat do loterie a vyckat si radu na ich nove cislo. Jeden z Markovych oblubenych momentov v Yangone bol jeho 1-eurovy zostrih v jednom z klasickych lokalnych holicstiev: 2 stolicky takmer rovno na ulici. Bez specialnych pokynov, pan holic sa pustil do vlnitch blond vlasov a prekvapivo, vysledok bol az tak dobry, ze sme sa museli vratit pred odchodom z krajiny a strih zopakovat. Najvacsiou atrakciou Yangonu je asi Shwedagon pagoda, ktora sa vysi az do 100 metrov a podla legiend tu stoji uz vyse 2500 rokov. Pocas tejto doby sa samozrejme menila, povacsine rastla a pribudali na nej farby zlata a vzacne kamene. Vdaka zlatu, diamantom a inych kamenov je pohlad na nu za slnecneho dna priam oslepujuci. V areale pagody, ktory pozostava z desiatok chramov a oltarov obklopujucich hlavnu atrakciu, sme stravili niekolko hodin, skryvajuc sa v tieni pred horucim slnkom a pozorujuc navstevnikov ako vykonavaju nabozenske obrady, ci sa len tak prechadzaju. Ludi tu bolo plno, necudo, tato pagoda je pre budhistov velmi vyznamnym miestom. Tu sme sa prvykrat dozvedeli o tom, ake je v Myanmare dolezite poznat svoj den narodenia. Rozne dni tu totizto mali rozne oltare a miesta, pri ktorych sa ludia vtedy narodeni modlia. Cudzinci tu samozrejme musia platit 8 dolarove vstupne, ktore ide rovno vlade a kasy su pri vsetkych branach. Plateniu sa azda da vyhnut ak vam niekto pri odchode da svoju vstupenku – nalepku, ktoru navstevnici nosia na tricku. V anglickom texte najdete galeriu obrazkov z tejto krasnej pagody. Trvalo to niekolko mejlov a koordinacie, no nakoniec to vyslo paradne: nas posledny vecer v Myanmare bol prvym vecerom pre Maartena a Nicole. Maarten a Nicole (dobri kamarati z Holandska) prisli do Yangonu cez VSO, medzinarodnu organizaciu, ktora umiestnuje dobrovolnikov na kratko- ci dlhodobe projekty v rozvojovych krajinach. Mark sa pozna s Maartenom uz z univerzity v Rotterdame a maju spolocne to, ze uz niekolko rokov nezili doma. Preto stretnut sa v poslednom case pre nich nebolo jednoduche. Tym vzacnejsi bol tento vecer – kto by to bol povedal -v Myanmare. Vyzdvihli nas v nasom hoteli na sever od centra a nedaleko sme si dali veceru a pivo. Hotel, v ktorom sme byvali mal vo dvore akusi zoo: papagaje, kakadu, ponici a vela psov boi zaiste majitelovym konickom. Na druhy den skoro rano nas odviezol taxik na letisko a lietadlo spolocnosti AirAsia do Kuala Lumpur, kde sme stravili noc v hoteli blizko letiska (Sri Enstek, doporucujeme na dlhe prestupy). Dalsi skory ranny let na druhy den nas vzal do noveho kontinentu pre nas oboch: do Australie! Vyber fotiek z Yangonu je tu.